So since it does have zucchini in it, I'm going to eat this guilt free and classify it as a vegetable. It's a soft, rich fudge cake that has a deep chocolate flavor. I once served this to my best friend who is a sworn carnivore (he seriously doesn't let a vegetable touch his lips) and he couldn't tell there was zucchini in it! Success! It's a recipe that my mom's made for years. My sister and I grew up eating and craving this cake. 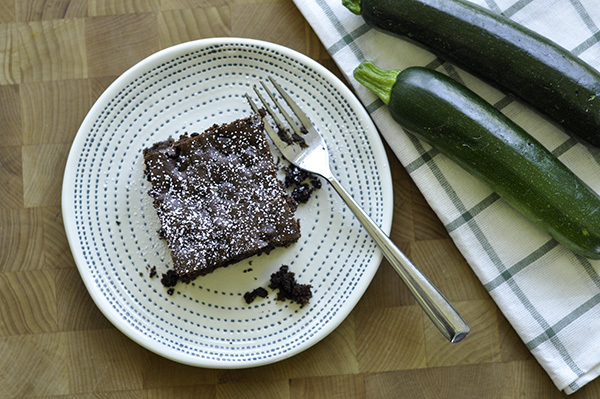 The zucchini keeps it moist, and really good cocoa powder gives it it's rich chocolate flavor. I can't describe how good this cake is. So I'll just go ahead and show you. 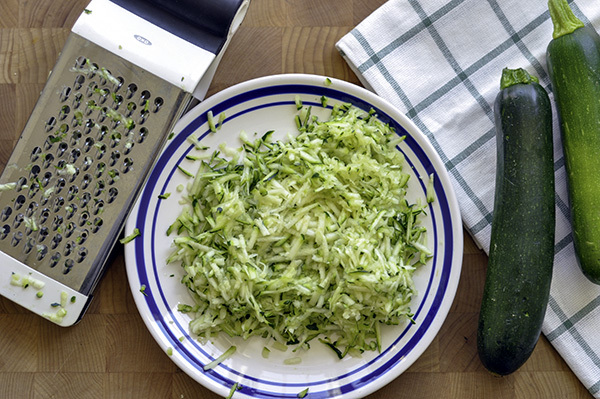 It begins by grating one medium sized zucchini, this yields about 2 cups. To make the batter, cream the butter and sugar until light and fluffy, Add in the eggs, and vanilla and beat till combined. Then this is the part I found a bit unorthodox, you mix in the flour, cocoa powder, baking soda, salt and sour cream at the same time. When making a cake I've always mixed in the flour and liquids separately a little at a time. So when I re read my mom's recipe I thought it was a slight bit strange, but it had always turned out good anyways. I added a bit of coffee to this batter to help punch up the chocolate notes. And finally folded in the grated zucchini and chocolate chips. I love how this batter is speckled in green! Pour the batter in a 13X9 pan and bake at 350F for 40-45 minutes. Try your hardest to wait for this to cool before digging in, but I do love eating it warm while the chocolate chips are still melty!! How good is that!? Also a sprinkling of powdered sugar also makes this all the more special and pretty! Who can resist a chocolate cake covered in a snow white blanket of powdered sugar! This cake is warm, fluffy and fudgey all at the same time! Plus is made with zucchini so you can count it as getting on board with this zoodle craze! It's a zoodle cake! Which totally makes it healthy, which makes the calories seem non consequential right? Totally! Get on board with me! Let me know what you think and as always follow me on instagram for more recipes, pics and eatings around town! In a large bowl of an electric mixer cream the butter and sugar. Add in vanilla and eggs and bear until light and fluffy, approximately 5 minutes. with the mixer on low add in the brewed coffee and mix until blended. 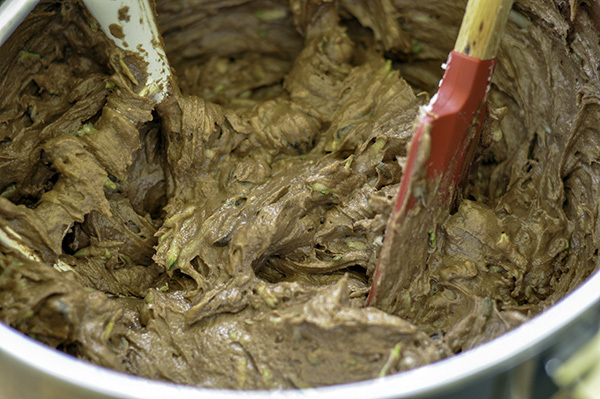 Spread the batter into the pan and bake for 40-45 minutes or until inserted toothpick comes out clean. Cool cake on a wire rack. Sprinkle with powdered sugar and enjoy! !